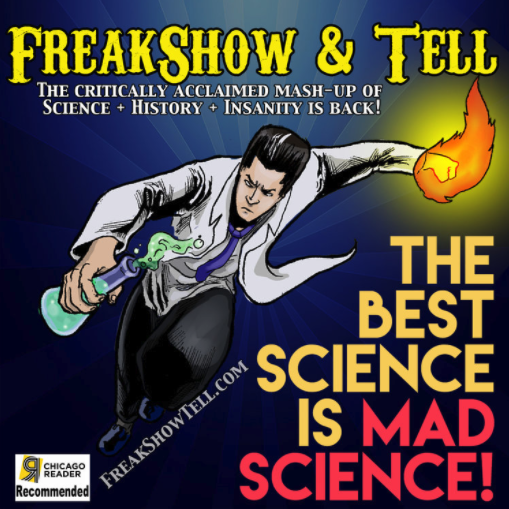 See FreakShow & Tell LIVE! Thom Britton explains how fire eating works. Some shows are 18 and over ONLY - because of booze and dirty jokes. See below! Click here for High-res press photos. Learn the science behind sideshow. Sideshow performer Thom Britton created a stage show to answer the barrage of questions he regularly received before, during and after his performances. People wanted to know how he could possible eat fire or drive a nail into his head or why he'd want to walk on broken glass or stand on an electrified plate. Thus was born "FreakShow & Tell", an hour and fifteen minute long stage show that fuses science, history, anatomy, physics and a whole slew of others with genuine sideshow acts such as The Electric Man, Fire Eating and Glass Walking amongst other things. The show is funny, poignant, entertaining, fast paced and 100% science! In Chicago - The show is for ages 18 and up. No one under 18 will be allowed in the venue. We are drinking and making dirty jokes. Sorry, kids. In Oshkosh - The show is for ages 18 and up. No one under 18 will be allowed in the venue. We are drinking and making dirty jokes. Sorry, kids. In Mason City - There is a 6pm all ages show and an 8pm show recommended for 16 and up.